As with the campaigns, “Return Yili to his Father”, “Save Ariel”, “Do Not Let Mario Alberto Perez Aguilera Die”, “For Dignified and Decent Housing for all Cubans”, “Do Not Let Orlando Zapata Die”; again, the Rosa Parks Movement as a part of the Central Opposition Coalition, and the Front sensitized to the pain and suffering of others, has launched a new campaign to pressure the Castro regime into providing the young mother, Lara Yaima Alfonso, and her newborns with a roof over their heads and a living commensurate with their situation and needs. Presently, the 28 year old Yaima, is living in the maternal room of the Placetas General Hospital, where just a few hours after giving birth to these innocent creatures, the mother refuses to leave until they have a place to live, but she may be thrown into the street at any time. The suffering of this Cuban mother strengthened to the harsh reality of not having a crib, diapers, bottles nor basket; and the cruel rejection of his parents due to his homosexual condition, another achievement of the Castro revolution fragmenting families over differences in political, sexual (orientation) of whatever type. “Fine, that take it now, because I’m not going to turn away from these people, not now and not when my problem is resolved, because they are the only ones who really helped me.” Such was the brave and honourable response to a family sent and manipulated by the political police. And indeed they returned with the lunch that they had taken to her, as they also removed the fan that the patient needed, but thank God and the women of Rosa Parks, Yaima is having lunch every day and enjoying a fan. The case of Yaima and her little innocent creatures are the reflex of the mentality of hatred of a regime which must be called a reflection to you, dear reader, wherever you go raise your voice as a form to put pressure on the Castro dictatorship so that he gives a home to Yaima and her children. A group of Santería practitioners from Placetas, as a sign of will, independence and a liberating spirit, have decided to shortly appoint a group independent of state control, which so far they have agreed to call the Independent Yoruba Association. It will be headed by the priest of that African religion Jonniel Rodríguez Riveról, initiated in the Ollá orisha worship called Ollálarde. The commissars of the political police are doubly alarmed by this situation. In the first place because it extends independent civil society in ways that group them beyond their ethnicity, and especially because most of this group are open political opponents of the regime and many have participated and engaged in acts of protest and civil disobedience. They are said to have lost their fear of tyranny and its repressive methods. Rodriguez Riverol will very soon have a twitter account called @yorubalibre which will be accessible to colleagues anywhere in the world to exchange information, experiences and especially experiences from here, where freedom of thought, expression and religion is massively violated. Congratulations to these Free Yorubas whose vice president will be Loreto Hernández García. Great success in your noble enterprise. Julio Columbié Batista is a young peasant from Batey Grúa Nueva in the town of Violeta, Ciego de Avila. This co-chairman of the Central Opposition Coalition in that province, director and founder of the Orlando Zapata Tamayo National Civic Resistance and Civil Disobedience Front, is one of the brave opponents devoted to the cause of freedom in Cuba. Without long academic instruction, nor a high cultural level he is an opposition leader in his community, beyond what has been developed in many in big cities. His sugar workers’ town has around a thousand houses and 3,000 persons engaged in agricultural activities mainly the sugar harvest. There he has managed to win the well deserved respect and admiration of all his neighbors who recognize and like him. The political police, to get people to participate in their “acts of repudiation,” have had to resort to people from other places because his neighbors not only admire him but also are willing to stand behind him. It has been determined when the opposition protests there, they bring a number of members of the Special Branch and the Ministry of Interior to threaten and terrorize their neighbors if they join or support the protests. His home is still thatched and rustic with a dirt floor and no shortage of large visible signs of non-cooperation campaign to draw attention. 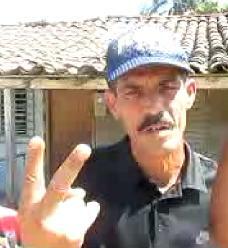 One of the strongest pillars of the Front and the Cuban resistance is located in the Grúa Nueva village where discontent and the number of opponents are capitalized, and the opposition wins spaces. Reforms by Raul Castro: self-employment, immigration reform, with abolition of the so-called “white card or exit permit. Every time I listen to some analysts and wise guy lecture on that topic, I think they have lost their sense of reality of what a Communist style totalitarian dictatorship is. To exercise the legitimate and sacred right to travel freely, in other words to leave and return freely from one’s own country is a right. If the regime in Havana allows citizens to freely leave and return, it immediately stops having at its disposal one of the most important tools of repression. If they eliminate the travel permit — the “white card” — the political police lose a sophisticated weapon of political pressure and blackmail. If Cubans were allowed to leave and enter freely it would cost the regime their campaign of demonising capitalist society. Sometimes I think some have truly believed in those economic and social manoevres implemented by Raulato (Raul Castro) to buy time and divert attention from true reforms. It bothers me that our compatriots, inside and out, with sufficient information and experience with Castro, believe that the beginning of a real liberalisation programme can wait for a meeting or a party congress. I do not understand how they expect a general, stained with the blood of thousands and thousands of Cubans, who encourages sinister mobs and is the instigator of so much crime, to cause what amounts to the collapse of the one thing in what he is most interested: total power. And if so, it is good to know that we are thousands and thousands of Cubans who for reasons of principle, common sense, and above all in honour and respect for our martyrs, do not want changes with the Castros, nor do we accept mediated solutions that would mean continuity, succession and exemption of blame for those criminals. For reconciliation without justice first, is as unacceptable as it is ignominious. Lieutenant Colonel holding up a blanket to block the filming of repression against peaceful women. Everyone who has seen the footage of the Rosa Parks Protest Movement in Santa Clara from Feb. 1, will understand not only the repressive machinery of the Castros but how ridiculously they behave. Paradoxically this time it was not the hitting, dragging, or even the protest itself that attracted the most attention, for that is something that we are accustomed to, but that Lieutenant Colonel wearing his dress uniform displaying his military rank of Lieutenant Colonel making a fool of himself trying to make cover up with a blanket the repression against the girls of Rosa Parks. Too bad we could not even identify them by their names! And we will, but the suit and visible military ranks speak volumes and lay bare the repressive nature and lack of ethics of the Castro-communist repressive apparatus. The women: Idania Yánez Contreras, Damaris Moyas Portieles, Yanisbel Valido Pérez, Xiomara Martín Jiménez, Yaite Dionelli Cruz Sosa and Yris Tamara Pérez Aguilera were the participants in that historic day as part of the marches for freedom and impunity that this women’s organization has been holding for two months. The January march demanded freedom Ivonne Mayeza Galano, her husband Ignacio Martinez and the rest of those arrested in the protest in Fraternity Park and the latter called for the release of Lady in White Yasmín Conlledo Riverón and her husband Yusmari Rafael Álvarez Esmoris arbitrarily arrested during a peaceful protest in the city of Santa Clara. Congratulations to these brave Cuban women, pride of our nation. Although Castro’s henchmen did not want to see these images, the Cuban resistance has managed to bring them out. This is march and arrest in Santa Clara of the women of the Rosa Parks Women’s Movement for Civil Rights this February 1, 2012. 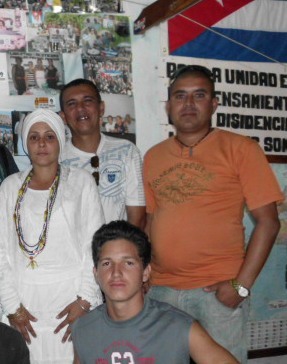 They march for freedom, against the impunity of power, and for Yasmin Conlledo Riverón, arbitrarily imprisoned with her husband Rafael Alvarez Yusmani Esmoris from January 8, 2012. 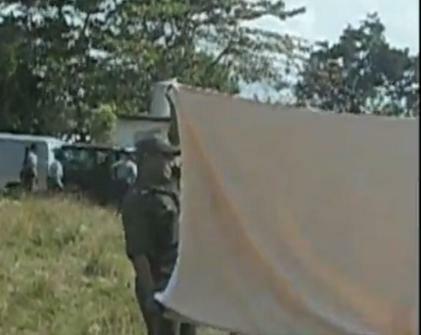 The officers of the State Security held up a blanket to prevent recording images of the arrest. It was the wrong move. They would have to cover all of Cuba with a gigantic sheet to prevent our voices being heard, and we would still scream for freedom.